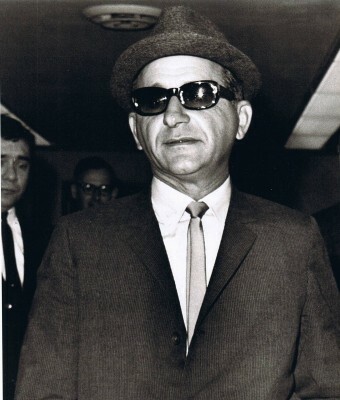 The son of Sicilian immigrants, Sam Giancana, also known as “The Cigar”, was born as Momo Salvatore Giancana on June 15, 1908 in Chicago, Illinois. As a teenager, he led a gang that did small jobs for the infamous Chicago Mafia headed by Al Capone. Sam soon was promoted to wheelman, or driver, in the Capone organization. By age 20, Giancana had been the prime suspect in three homicide investigations. Giancana married Angelina DeTolve in 1933. They had three daughters. (One of them wrote a book in 1984 called Mafia Princess.) Throughout the decade, Sam concentrated on increasing his standing in the mob. Capone went to jail in 1931, which changed the power structure of the Chicago Mafia, and Giancana took the opportunity to climb the ranks. Sam also went to jail for the first time during the ‘30s – he served a term in the pokey for bootlegging whiskey. In the 1940s, Giancana decided to take over Chicago’s illegal lottery and gambling rackets. Since asking nicely didn’t do the trick, a series of brutal beatings, kidnappings, more beatings, and murders were in order. Once Sam and his pals won control of the numbers racket, the Chicago Mob’s yearly income increased by the millions. When Anthony “Tough Tony” Accardo retired in the mid-1950s, Giancana took over as head of the Chicago outfit. Under his tutelage, the organization went from a relatively small-time racket to a full-scale professional criminal operation. And Sam Giancana, like Al Capone before him, became a celebrity mobster. The FBI bugged Giancana’s headquarters at the Armory Lounge in Forest Park in 1959. Over the next six years, they gathered intelligence on the inner workings of the Chicago Mafia and of their activities locally and nationally. Thus began the Cigar’s downfall. Sam’s beloved wife Angelina had died in 1954, and Giancana became a notorious womanizer after her death. He hung out with entertainer Frank Sinatra, and some believe he used the singer’s ties to the Kennedy family to try to get Attorney General Bobby Kennedy to end his crusade against organized crime. There has always been speculation about Giancana’s ties to President John F. Kennedy. It’s probable they both shared actress Judith Campbell Exner as a girlfriend for a spell, but how much information, if any, she was passing between the two men has never been established. Giancana liked to claim that a vote-stealing scam he organized in Chicago was instrumental in Kennedy taking the 1960 presidential election. There’s a theory that the Kennedy assassination was a mob hit in retaliation for Bobby’s anti-mob rabble-rousing when the Mafia was (in their own estimation, at least) instrumental in winning JFK the presidency. Giancana was extradited from Mexico in 1974, where he’d gone after serving a one-year prison term for refusing to testify before a grand jury investigating organized crime in 1965. He was being called to testify before another grand jury and was granted immunity, but provided little information of any value. But the government wasn’t done with Sam yet. Next he was called to testify before a United States Senate committee about mob involvement in that CIA plot to snuff Castro. But before he could take the stand, someone shot him to death with a .22-caliber automatic pistol on the night of June 19, 1975. The killer has never been identified. Theories abound to the shooter’s identity. Could it have been a hit ordered by CIA operatives concerned about his upcoming testimony? Perhaps a crime of passion by a jilted ex-girlfriend? Maybe. But a far more likely scenario is that Giancana was taken out by the mob. For starters, Giancana’s high profile drew far too much attention to the Mafia. After all, they were mobsters, not movie stars. Wielding power from the shadows works much better for criminal masterminds. Aside from that, Sam wasn’t sharing his profits from his offshore gambling racket and was angling to be Outfit boss once more. The fact that Giancana was killed in his home while cooking also, perhaps, points to his killer being someone he knew and trusted.